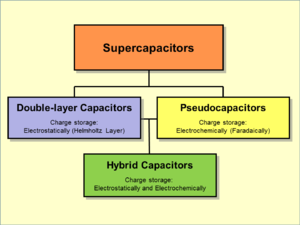 ^ B. E. Conway, Electrochemical Supercapacitors: Scientific Fundamentals and Technological Applications, Berlin: Springer. 1999: pp. 1–8, ISBN 0306457369 （德语） See also Brian E. Conway in Electrochemistry Encyclopedia: Electrochemical Capacitors — Their Nature, Function and Applications 互联网档案馆的存檔，存档日期2012-08-13.